Who would win in a fight? Fifty duck sized horses who can turn invisible while singing showtunes or a senior citizen bowling team wielding lightsabers? 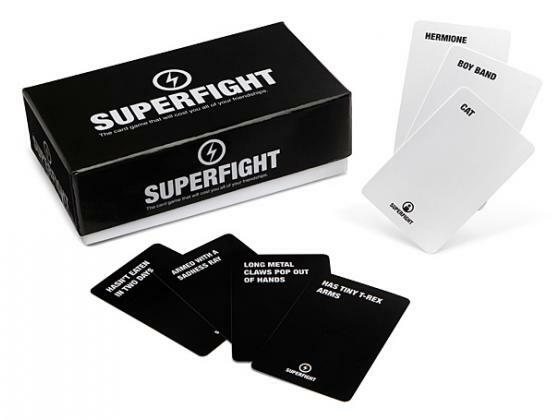 Superfight is a fun party game for up to 20 players that's quick and easy to play. The rules are simple: all players argue over who has the best fighter! Each round begins with all players drawing 3 character cards (white cards) and 3 power/weakness cards (black cards). Next, everyone picks their best, or most hilarious, character and ability combo. After everyone has presented their fighters, each player draws an extra black card to add to their fighter which will add a new power or weakness. All players then argue over who would win in a fight! Once the winner is chosen, all cards are discarded and a new round begins with everyone drawing new characters and power/weakness cards. Includes 160 character cards and 340 power/weakness cards.